I just came across this coke TV add full of Wipika gear released in 2000. "Historic turning point for kitesurfing back in 2000. The Coca Cola waves of freedom campaign nationwide primetime TV, cinema, billboards, buses, POS and event schedule. By far biggest boost and most significant media event for kitesurfing ever." 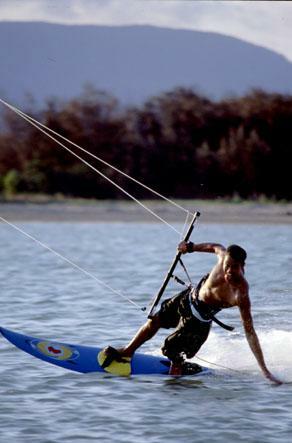 "Mat Colefax introduced Kitesurfing to Australia in the summer of 97/98 when he travelled the coast from Cairns to Melbourne with his Wipika 5.0m Classic kite. For the first time ever in Australia kitesurfing was practiced as a real sport by a dedicated kiteboarder. And just as everywhere else in the world, Wipika Marine Wings were the catalyst that created our great new way of surfing. 1st is forever and Mat is still Australia's 1st, recently to bring kite hydrofoiling to Australia and Supkiting and the Journey concept and inflatable paddleboarding among many others. Click coloured texts for links. The start and growth of kiteboarding in Australia are inextricably linked to Mat and Rebecca Colefax - this is Mats story." Kitesurfing came to Australia when Ian Young from Western Australia started to import and sell Cory Roesler's Kiteski in 1997, Ian also imported and sold Concept Air kites well before Matt Colefax came along with the first Wipika. Even I had begun to kitesurf prior ro matt turning up at Mooloolaba in Qld where I flew that first Wipika and chose to keep kiting with Flexifoil Blades. My friend Bob Dawson and I first Kitesurfed at Sawtell and Coffs Harbour with one of Bobs huge delta D-Wing kites and surfboards. Thanks for setting the record straight Steve. I was more intrigued by the Coke commercial than anything else. I came in with the Wipikas myself in 1998 missing the delta stacks and Kiteski rigs like you earlier guys. Hope all is well with you and yours in Oz.